The buzz around the mobile industry has been the BlackBerry Bold (aka. 9000) which has been keeping the Press busy and sending it's maker's (Research in Motion) stock to an all time high of $142 today. The reason why this company has garnered so much attention is because of its participation of mobile progression in the U.S.
From the beginning, BlackBerry has been a silent but consistent workhorse as an email communications device. It has perfected mobile email technology for businessmen on the go and gained trust from corporate America. With a simple, yet reliable software interface and full QWERTY keyboard; it offered a no-nonsense professional solution second to none. This will prove to be an important payoff for this Canadian company later. In the beginning, RIM didn’t care for bells and whistles, it focused on proprietary push-email technology and perfected its hardware to perform reliably. I remembered how durable every one of my BlackBerrys have been. Little by little, they gained market position as a smart device leader and migrated into more features like voice, data and internet. Ultimately, this led the company to a path in becoming the best all-in-one smart device. By perfecting its communications functionality; it has gained the trust of S&P 500 companies. A BlackBerry has become synonymous with words like “work” and “professionals” and the gold standard for American Corporations. Now, BlackBerry, more popular than ever, is ready to take on the entire world. With 3G iPhone looming, BlackBerry strikes first and strikes hard. With the new model Bold (9000), they bring a whole new level of sophistication into a bulletproof gadget. With a high resolution 480x320 screen, 3G HSDPA over GSM, WiFi, GPS and a slick new GUI in its latest software platform just to name a few; it is very clear where RIM is going with its future: to become the best multimedia smartphone for work and play. 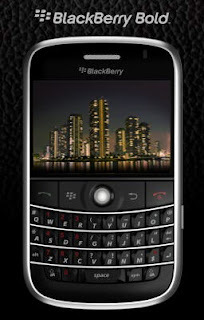 The launch of BlackBerry Bold holds real significance to the mobile movement in the U.S market. We’ve always been in a market that is vastly different than our Asia and European counterparts. In the U.S., we prefer to have a functional device that is standardized and driven by work productivity; BlackBerry has proven to be a highly productive tool. Unlike traditional mobile manufacturers (Nokia, Samsung, Moto, SonyEricsson) where they market right into the heart of consumers, RIM's strategy is to build a successful empire with the business crowd; then they leveraged their success and morphed their products into a mass-appealing consumer multimedia device. The launch of Bold is a testament to their transition. As a result, RIM/BlackBerry growth has been phenomenon and its proven business strategy of moving from one market into the next will definitely make text book material for business schools for years to come. BlackBerry is no longer silent and it wants you!